Assuming my final assignments are acceptable to my mentor, I’m finally done with my online ARRL course! “Introduction to Emergency Communication (EC-001)” began on February 29, and it officially ends next Friday, April 27. I wrapped it up tonight since next week is going to be pretty full. When I signed up for this course I had no idea I would learn so much. I highly recommend it to every ham, no matter how long you’ve had your license. The text really is well done, the assignments are far from busy-work (they took me places I’d never gone before, and probably wouldn’t have gone had I just read the book), and if all the mentors are like the mentor I had (Sena Frank, NI1Y), you’ll receive sound advice and have a great time. Now I’d like to take the next course in the sequence! “Public Service and Emergency Communications Management for Radio Amateurs (EC-016)” is free, I see. But I’ll probably take a week or two off before taking that on. You can learn more about these online courses at http://www.arrl.org/online-course-catalog. This post was updated on 4/2/12 after Mr. Angelos kindly corrected me on several points. The 2012 MNVOAD Training Conference was well-worth attending! 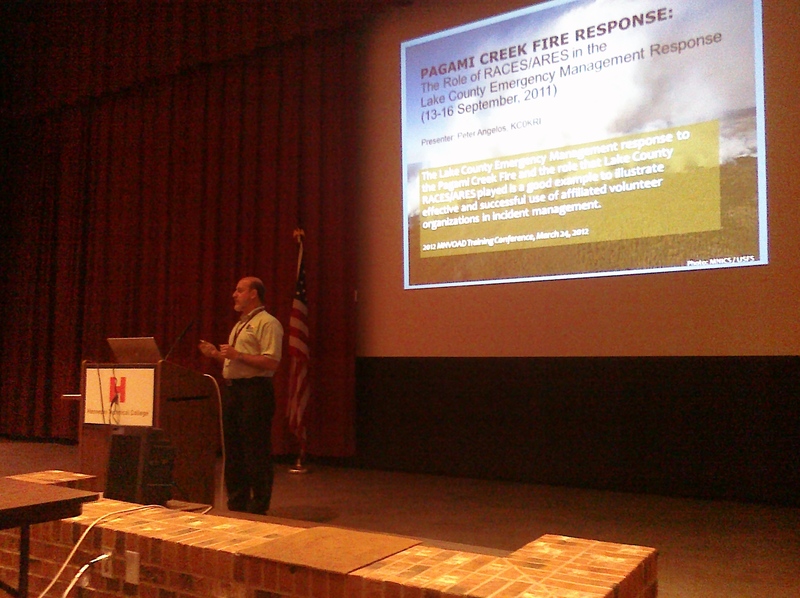 My favorite part, of course, was the presentation by Peter Angelos, KCØKRI, on the Lake County, MN RACES/ARES® response to the Pagami Creek Fire in September, 2011. His “keystone” speech was the first of the many sessions that day, and the only plenary session (the other 15 sessions were breakouts). While he focused upon RACES/ARES®, he also discussed principles that apply to any voluntary organization. RACES/ARES® fills gaps in existing communication-systems, and reduces load on those systems. A lightning strike on 8/18/11 13 miles east of Ely started a fire that ultimately caused $23M in response expenses in Lake County. On 9/12/11 this became the largest fire in Minnesota since 1918, with 92,682 acres and over 800 workers assigned through 10/17/11. Fires are an annual occurrence in Lake County, the home of the famed BWCA (Boundary Waters Canoe Area); what made this fire unusual was its size. Cell phone coverage is the only phone service available in some parts of the area, and in some parts not even that. An 800 MHz public-safety trunked system using portable antennas was also set up to provide coverage. Many hours of training and dedication go into RACES/ARES® in preparing for an event like this. RACES/ARES® personnel stayed far behind the actual fire line. The Lake County RACES/ARES® group is a “spring chicken,” having been organized in mid-2009. As the smoke plume blew as far as Milwaukee, WI and Minneapolis, MN, the potential for health & welfare inquiries increased. A RACES/ARES® communicator was attached to the evacuation shelter manager. Hams were also located at the incident command post, staging area, evacuation checkpoints, and the EOC. The goal was to handle non-emergency traffic to take the load off police, fire, and rescue channels. The log of messages kept by RACES/ARES® is helpful for post-event evaluation. The Lake County RACES/ARES® group uses two state-of-the-art vehicles, each outfitted with a PSN (Public Switched Network capable of establishing a cellphone network), as well as 2m/75cm FM/Packet and all HF modes including WinLink, WINMORE, Pactor, and other digital modes. One of these vehicles is a trailer of their own (the “MCT”), while the other is an RV (the “AMCV”) purchased by an 11 county consortium in the northeast Minnesota Arrowhead Region (with help from a grant). This vehicle can provide video conferencing and internet connection via satellite. The repeater network available is huge, extending from Ely, MN to Solon Springs, WI. RACES/ARES® deployed for a total of five days, suspending operations on 9/16/11 after contributing 633 man-hours. The Lake County RACES/ARES® group provided 445 of these hours, with the remainder provided by mutual aid from RACES/ARES® groups in four neighboring counties. The Lake County RACES/ARES® group would never have been invited to participate if it weren’t for the well-established relationships that had been built with Lake County Emergency Management and the Lake County Sheriff’s Office. Professional conduct and standard ICS documentation-procedures are essential for establishing credibility with served agencies. Served agencies expect to see stuff like this duty roster. None of this could have happened without the “four C’s” (communication, coordination, collaboration, and cooperation), the hallmark of VOAD. They couldn’t invite themselves to drills — they had to participate in non-emergency events like local marathons and sled dog races to demonstrate their capability and build relationships. Only then did they get invited to their first drill. Lake County RACES/ARES® volunteers are required to complete FEMA courses IS-100b, IS-200b and IS-700a. These hams are volunteers with the Lake County Emergency Management Department. They are required to have security background checks, they all have photo ID’s issued by Lake County, and they are even insured by the county. As a result of this relationship-building, the Lake County Emergency Manager got her amateur radio license (KDØHHW) and joined this RACES/ARES® group herself. So much credibility has been established with served agencies that this RACES/ARES® group has been entrusted with the housing and maintenance of the AMCV. If you get a chance to attend a VOAD conference like this, I heartily encourage you to do so. Not only did I learn from KCØKRI’s presentation, I also learned quite a bit from several other breakout sessions. It is clear that ARES® work is not conducted in a bubble. To be efficient and effective (much less to even be invited to participate) in an emergency we must develop relationships with the agencies we serve, from governmental entities to other voluntary organizations. The time to do that is not at the time of the emergency itself, but long before. Conferences like this one can be a great way to learn from each other.